Munich High End Show 2015 highlights | What Hi-Fi? The Munich High End Show is go – and we're reporting live from the event. We'll be rounding up the best new hi-fi products on show, and anything else that catches our eye. Keep an eye on the What Hi-Fi? Facebook, Instagram and Twitter accounts for more pictures from the show floor. See below for more on what new hi-fi and home cinema products we expect to be revealed at the Munich High End Show. AudioQuest will introduce its two latest 'mini' creations at the show. Three years ago the company unveiled its miniature DragonFly USB DAC at Munich (since upgraded to v1.2), and now it is expanding the range with the creation of the AudioQuest Jitterbug - an advanced USB line and data conditioner - and AudioQuest Beetle, a micro-desktop DAC (digital-to-analogue converter). The Jitterbug is designed to remove "unwanted noise and parasitic resonances that plague USB ports, while reducing or completely eliminating packet errors within the data stream", the company claims. It slots between the USB port on your computer and the DragonFly DAC/headphone amp. You can see what's inside the Jitterbug in our photo of the pre-production prototype below. As for the Beetle, the mini DAC can deliver uncompressed music via asynchronous USB or an optical digital connection. It also offers what AudioQuest claims is a world first with asynchronous Bluetooth connectvity. UK prices for both products have still to be confirmed, but we'll bring you more information and pictures live from the Munich Show next week. AudioQuest will also be showing off its Nighthawk headphones, one of our Stars of CES 2015, as well as the first of its new power conditioning products, the Niagara 7000. It will be a busy show for Astell & Kern, with the official launch of its new £399 entry-level AK Jr product, plus new power amp and power supply models to match the Stars Of CES-winning AK500N. There are also more launches in store, which will be revealed on the first day. The AK Jr is small in price and small in size, measuring just 6.9mm at its thinnest point - the same as the iPhone 6 - and 8.9mm at the largest point. It’s lightweight too, weighing in at 93g. The new player supports 24-bit/192kHz high-res audio playback and supports a wide range of file types, including DSD audio. 2.8MHz DSD files are converted to PCM. US valve amp specialist Audio Research has upgraded its range of Reference Series power amps to 'SE' status, replacing the KT120 model with the newly introduced KT150 which, it says, has had "significant performance upgrades". Also on show will be the Reference 75 SE, reference 150 SE and Reference 250SE. One of the highlights of the Audio-Technica stand will be its flagship AT-HA5050H headphone amplifier (above) with a range of connection options for a variety of headphones with different impedances. There are XLR, USB (asynchronous or adaptive), SPDIF and RCA line inputs. It includes a high-end DAC (digital-to-analogue converter) and the amp also supports playback of DSD 128 music files. Joining it on the Audio-Technica stand will be the firm's MSR7 over-ear headphones, which will be demonstrated using a selection of high-res music on a PonoPlayer, and the in-ear CKR9 and CKR10 models. Visitors will also get to see the portable Audio-Technica PHA100 headphone amplifier, unveiled at CES in January. Munich marks the first public showing of the wireless StreamAMP 100 (above) and the unveiling of Cabasse's new high-end speaker, the Pacific 3. Cabasse says the Pacific 3 features several technologies carried over from the flagship La Sphère and L'Océan models. The company's co-axial drive unit technology is used in the Pacific 3's three-way design - the BC13M midrange-tweeter unit coming directly from the two flagships. Also borrowed from La Sphère is the honeycomb membrane bass driver construction. Joining the Cabasse Stream range of products is the StreamAMP 100, a wireless four-channel amplifier. It can access thousands of internet radio stations, stream Spotify and Deezer and connect to your digital music collection - all of which can be controlled using the new StreamCONTROL app. What can we expect from Canton at the show? A full refresh of Canton’s Reference series speaker range, that's what, with big changes both inside and out. We'll bring you more details when the show opens, but for now you can get an sneak peek at the new models in the photo above. Chord Electronics is planning to make a big splash at this year's show with the launch of a new "reference-level" product and two rooms to demo its latest products. Details of the new product remain under wraps, and all will be revealed at 6pm on the opening day of the show during the company's press conference. We'll be there to bring you breaking news as soon as it happens. Visitors to Munich will also be able to experience the new Chord 2Qute DAC, the firm's flagship Reference system, a full compact Choral system, the CPM 2800 MkII integrated amp as well as see and hear the new Hugo TT DAC/headphone amp. Who could resist the wonderfully retro looks of this valve-based DAC and headphone amp from Copland, the DA 125? Definitely old-school in its design, we look forward to hearing it in action. It was one of our Stars of CES 2015, and for those of you who didn't manage to see it in Las Vegas this amazing-looking Momentum Lifestyle Amplifier (MLife for short) will be on display at Munich. Beneath its sci-fi looks the MLife incorporates AirPlay and aptX Bluetooth wireless streaming and naturally it supports all manner of high-resolution audio formats. You can read all about it, and see more pictures, in our original news story. Also look out for Dan D'Agostino's new Momentum Phonostage and Master Power range, which are said to be reminiscent of Dan's "classic power amp designs for Krell". Meanwhile over on the Devialet stand you will be able to clap eyes on the gorgeous looking Phantom wireless speaker we saw at the Bristol Show back in February. The company will also be introducing the 8.0 firmware update for its Expert range. Star of the Esoteric stand will be its flagship Grandioso system, worth around €300,000, partnered with Audiograde speakers. The full Esoteric Grandioso set-up comprises: Grandioso P1 CD/SACD transport (€36,000); a pair of Grandioso D1 mono-DACs (€18,000 each); the Esoteric G-01 Rubidium Master Clock (€20,000); the Grandioso C1 preamplifier (€36,000); and no fewer than eight Grandioso M1 mono power amps ( (€18,000 each). Phew! And if that's not enough, the entire system will be played through the aforementioned Audiograde speakers. As we've previously reported, German Physiks will launch its "ultimate" speakers at Munich, the £12,000-a-pair HRS-130 and the £8900/pair Ultimate version of the firm's Unlimited MkII speakers, which will be available in a striking range of gloss colours: black, white, yellow or red. They'll be on demonstration at the show, partnered with electronics from Esoteric and cabling from AudioQuest. You can read more about the German Physiks speakers in our news story. Star of the Harman Luxury Audio stand will be the Mark Levinson No.536 monaural amplifier, a fully discrete 400W Class A/B power amp, partner for the Mark Levinson No.52 preamplifier. Also in the Harman room will be the new Revel Concerta2 speakers, Revel Performa3 and Ultima2 speakers and special custom finish Everest DD 67000 and K2 S9900 speakers from JBL. America's legendary audio brand will showcase its new Digital Vanguard, which adds a range of digital connection options - including streaming via USB and Ethernet, as well as aptX Bluetooth - to its recently launched Vanguard integrated amplifier. It looks a bit of a beast to us. Leema Acoustics' Libra DAC/preamp (£6000, above) will make its continental debut at Munich. The flagship 'digital hub' will be joined by the Hydra II stereo power amp (£3595), the Xone 2.5 floorstanding speakers (£1750) and the new Xen 2 micro monitor (£1295). The Libra DAC has been designed for high-resolution audio playback and can handle DSD 64/128, DXD and 384kHz PCM files via USB. It uses Leema's new fully balanced Quattro Infinity dual-mono DAC modules which can be ugraded in the future should technology improve. Users can connect their digital devices via USB, a range of digital inputs (three optical, three coaxial) or stream via Bluetooth. For even more esoteric equipment, there are two 12S inputs via RJ45 connectors, as well as two XLR inputs. The M1 USB module provides connectivity for Windows, Mac and Linux computers. Leema says the Libra can operate either as a conventional audio component with fixed output level, or as a high-end preamplifier with full analogue volume control onboard. Outputs are provided via unbalanced RCA or balanced XLR connections. A headphone amp is also included. Company founders Lee Taylor and Mallory Nicholls will be on hand throughout the show to demonstrate the new Libra DAC and the firm's other products, all of which are made in Wales. British speaker manufacturer PMC has announced that Munich will mark the debut of its twenty.Sub, the latest addition to its twenty series speaker range. This new subwoofer, which has been designed for use with both music and movies, builds upon PMC’s design pedigree, combining the "finest drivers available" with the unique ATL (Advanced Transmission Line) bass loading principle, Class-D amplification and DSP control. All speakers in PMC’s room will be driven by a Bryston electronics system featuring the BDP-2 digital player, BDA-2 external DAC and 7BSST2 mono power amplifiers. If you're in the market for a slice of high-end hi-fi but don't want to pay high-end prices, then check out the new Chameleon range from Italian speaker specialist Sonus faber. Its new entry-level range starts from a very reasonable £480, and the three-strong Chameleon line-up is available with a choice of differently coloured leather side panels in black, white, blue, grey, orange or red. Each model is hand-made in Italy and you can choose from the Chameleon B bookshelf (£700/pair), the Chameleon T (for "Tower") floorstander (£1670/pair) and the Chameleon C centre (£430 each). 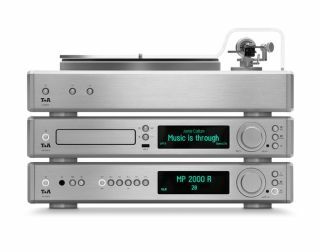 German hi-fi brand T+A (Theory and Application) will be busy in Munich with the launch of its R-Series 2000 range of components. Designed from the ground up, and incorporating much of the technology from the company's existing HV Series, the R-Series promises "exceptional sound quality in a diminutive package", according to its maker. There are four models in the R-Series range: the PA 2000 R integrated amp (£4204); the larger PA 2500 R amp (£5577); the MP 2000 R DAC/CD player/network player/FM and DAB radio (£4204); and the G 2000 R turntable which comes in two guises - either MM (moving magnet) at £3432 or MC (moving coil) at £4719. All four models will be available in the UK from late June 2015. We will bring you more details on these products in our Munich Show report. Tannoy will introduce three new floorstanding speakers at this year's Munich Show: the Revolution XT 8F (above), the Definition DC10Ti and the Limited Edition Turnberry GR. The Revolution XT 8F is the flagship model in the new Revolution XT series and features a 20cm version of the all-new Omnimagnet Dual Concentric driver with a matching 20cm bass driver in the speaker's signature trapezoid cabinet. It also has twin-cavity port loading and a downward-firing port for deep bass and easier room placement. We are testing the Tannoy XT 8F speakers right now and will publish our First Test in the July issue of What Hi-Fi?, on sale from June 3rd. Joining the Definition series is the DC10Ti with its contemporary curved cabinet, 25cm Dual Concentric driver and mass-loaded stabilising plinth. And for hi-fi traditionalists the Prestige series gets the addition of the Limited Edition Turnberry GR with its Alnico Dual custom crossover and special LE trim. Also on display will be a new finish for the mighty Tannoy Kingdom Royals. You may have previously seen the Air Force One and Two (pictured) turntables, wth their legendary Japanese enginering including air suspension and vacuum clamping, and at Munich they will be shown alongside the forthcoming Air Force Three. We can't wait. Making its European debut will be Wilson Audio's new "entry-level" floorstanding speaker, the Sabrina, alongside the company's unusual wall-mounted speaker Alida. The Munich High End Show takes place at the MOC exhibition centre from 14th-17th May. Further details are available on the show's website.